Just in time for World IPv6 Day, I’m pleased to note that Code.DanYork.com is now available over IPv6! This site runs on WordPress and while WordPress itself works fine with IPv6, the trick was to find a web hosting provider that provided solid IPv6 connectivity. After much investigation, I finally set up a basic web hosting account with Hurricane Electric. They’ve been in a leader in IPv6 deployment and have great interconnections to other IPv6 networks. They are also the folks behind Tunnelbroker.net, the free service I use to get IPv6 connectivity into my home office (using a setup for IPv6 with an Apple TimeCapsule that I described in another blog post). I had this site hosted at another webhost, but through the sheer beauty of WordPress’s export and import features I was able to move the entire contents of the site over to Hurricane Electric without any problem. For those curious, I’m running the site in WordPress’ Multisite mode as I’m planning to move more of my sites over to HE’s hosting. I’m using the Domain Mapping plugin to let me map different domains to different blogs. It’s all working wonderfully. 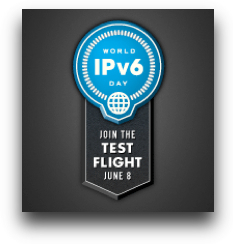 Welcome to the new IPv6 Internet! 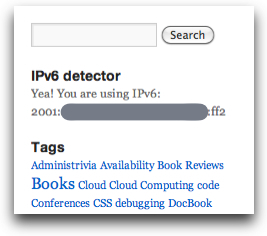 I’m using the “IPv6 detector” plugin for WordPress by Andres Altamirano, although I did alter it a bit. I shortened the text that was printed for an IPv6 address so that it would fit in my theme’s sidebar. I also removed the URL link and removed the extra links about IPv4 exhaustion. Installation was a snap, though… I just installed it into WordPress and then went to the Widgets area of my theme and dragged it into the location where I wanted it. This entry was posted in Administrivia, IPv6 and tagged IPv6 on June 7, 2011 by Dan York. This server has received 5726231 hits from both ipv4 and ipv6.